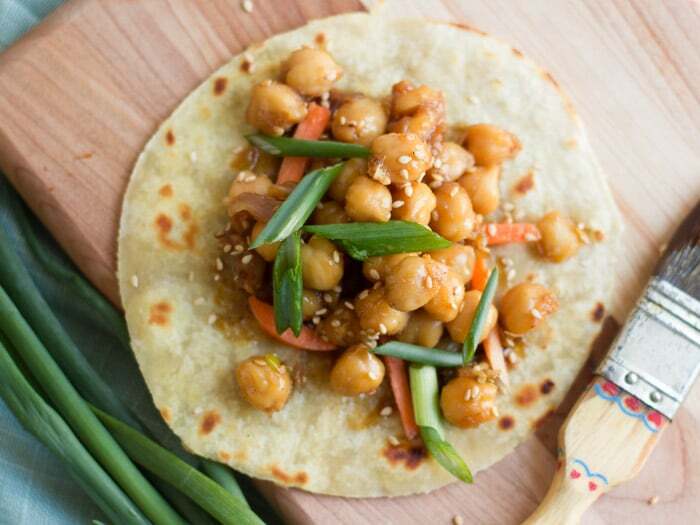 Peking chickpeas are simmered in a sweet five-spiced infused sauce and stuffed into homemade mandarin pancakes to make this satisfying and delicious vegan Chinese takeout remake! I warned you guys that I was going to do something like this. Chinese food + legumes. It just seems weird to me, but I’m getting over that. 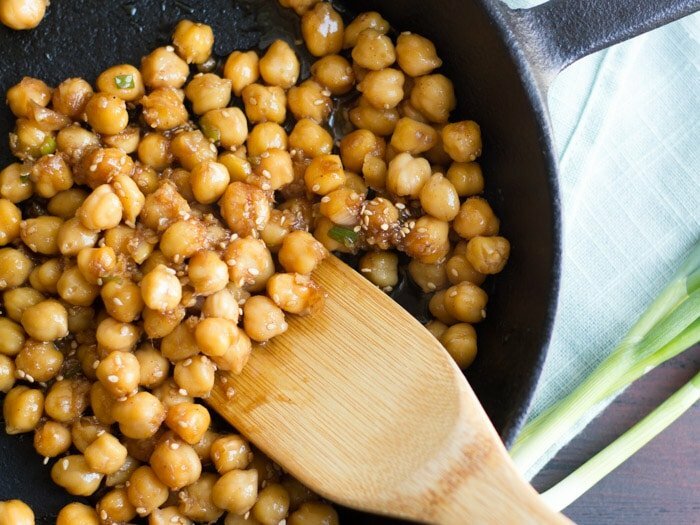 If tofu can go into Indian food, then chickpeas can go into Chinese food. Baby steps. I decided on Peking chickpeas for the pancakes. For whatever reason, Chinese food chickpeas in pancakes is less weird to me than Chinese food chickpeas in rice. I know, this makes no sense whatsoever! Fortunately, this turned out to be so incredibly delicious and satisfying. I might have gotten over my aversion to Chinese food and beans, and next time I might even make something involving rice. This time around though, I was so happy to have my dinner all wrapped up in cozy little pancakes. Everything about this meal was delicious and made me very happy. So, what are Peking chickpeas all about? Maybe they’re a veganized version of Peking duck, or Peking chicken. I don’t know! I did some poking around and those two dishes seem to be pretty different, with the former being a big old roast and the latter involving bite-sized saucey things but with no particular recipe requirements as far as I can tell. The common thread I found was pancakes and Chinese five spice, and if there are two things I love in life, they’d certainly be pancakes and Chinese five spice, so I decided to roll with it. The pancakes are super easy. Trust me on this. If you really don’t feel like making them, then go ahead and eat your chickpeas over some rice, and be sure to leave a comment telling me how tasty that was, so I’ve got a little encouragement to ditch the pancakes and go with rice myself next time. Stir flour and salt together in a medium mixing bowl. Stir in water. Transfer the dough to a lightly floured surface and knead for about 2 minutes, until smooth and elastic. Add a bit more flour to your work surface, and use a rolling pin to roll dough to about 1/8 inch thick. Cut into 4 circles, about 6 inches in diameter each (a saucer or small plate works great as a form for your circles). Place a large flat-bottomed skillet over medium heat. Brush both sides of one of your dough circles with sesame oil and place into hot skillet. Cook until you begin to see air pockets form in the dough, about 2 minutes. Flip and cook about 2 minutes more, until you've got some brown patches on both sides. Repeat for remaining dough circles. Stir soy sauce, maple syrup, rice vinegar, cornstarch and five spice together in a small bowl. Set aside. Coat the bottom of your skillet with oil and place over medium heat. Add garlic, ginger and white parts of scallions. Sauté until very fragrant, about 2 minutes. Raise heat to medium-high. Add chickpeas and soy sauce mixture to skillet. Cook just until sauce becomes thick and coats chickpeas, about 2 minutes more. Remove from heat and stir in sesame seeds and green parts of scallions. Brush a thin layer of hoisin sauce over the top of a pancake and sprinkle with carrots. 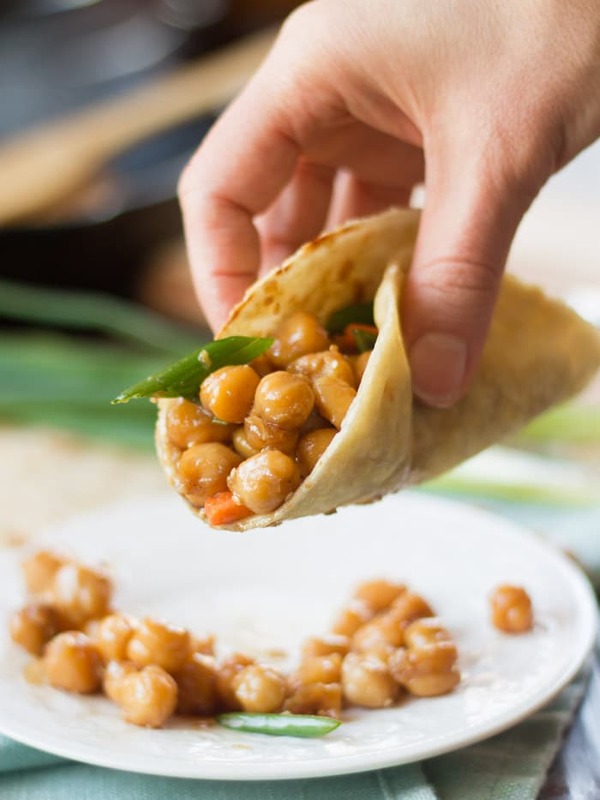 Top with chickpeas, wrap and serve. Nutrition information includes 1 tablespoon of hoisin sauce per serving. I’ve gone a bit bonkers for 5 Spice Noodles lately, thanks for rescuing me with an alternative use for my new fave spice blend! 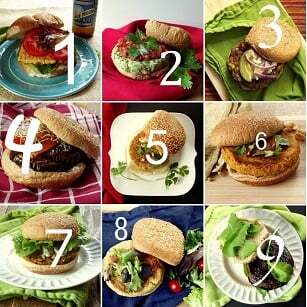 These look super fun and delicious! Five spice is definitely one of my favorites too! I have to hold back a bit, otherwise I’d put it in EVERYTHING! I had forgotten that today was Shrove (Pancake) Tuesday, and this recipe was the only one I had saved for which I had all the ingredients. I was a bit skeptical because I’m not a huge fan of saucy chickpeas or five-spice blend, but this recipe turned out so well that even though I doubled it, my fam would not have had any trouble devouring a triple serving. All your recipes are super good, but this one was exceptionally super good. Thanks for sharing it, Alissa! I’m glad everyone enjoyed it! I was actually skeptical too, but I kept seeing stir-fry recipes with chickpeas all over Pinterest, so finally I decided to give one a try. I’m so glad I did! If I were to use rice flour, would it change the texture of the pancakes? Looking forward to trying this sometime soon! It would definitely change the texture, and you might need to adjust the amount of liquid, but I’m not sure how much – sorry! I haven’t tested the recipe with rice flour!